A wine cooler can be great to have in any home but it’s even better to have one that is capable of fitting into the cabinets in your kitchen. The Whynter Undercounter Wine Cooler makes it easier for you to have a wine cooler in your home without taking up more space around your home than needed. This 28-bottle wine cooler features a design that is easy to add into your home and can fit plenty of bottles at a time. It’s also easy to control the settings within the unit. Think of this as a wine cooler that doubles as its own special cabinet that’s devoted to all your bottles. The Whynter Undercounter wine cooler was designed with a stainless steel body. The steel is accentuated with a matching handle on the side while a glass door is used to clearly display the wine as you are chilling it. The door can be reversed to make it open on the left or right depending on your preference. A black cabinet is also featured on the inside. It is paired with a series of racks that feature metal beams and wooden ends. These are six of these racks and each of them can be removed or repositioned as required. This design is intended to fit in with your kitchen cabinets under your counter. The stainless steel tone will fit in well with most places as it can create a good contrast to white tones or it will blend in with darker colors. The size of the cooler and the electric installations within your kitchen should be explored carefully. The cooler is 32 inches high, 15 inches wide and 23.5 inches keep, thus ensuring that it can fit under most counters. You might have to add some bonus accents on the top, bottom or side parts of the cooler if its space is too small when compared with other doors and panels in that area. You will need to ensure that the wine cooler can link to your electric system in your home as well. This uses a 115V/60Hz connection and should fit in with most systems. You should still be certain that you place the cooler near a spot where it will be easy for a connection to be set up. The Whytner Undercounter wine cooler feature a dual zone climate system. The upper zone can operate at temperatures from 54 to 65 degrees Fahrenheit while the lower zone can work from 40 to 54 degrees. The upper zone takes up only a third of the unit while the rest is for the lower one. The control mechanism is clearly featured on the front of the cooler. In fact, the buttons are very easy to review and adjust as necessary. You can even choose to change the temperature display to Celsius if you prefer. The LED lighting on the inside of the cooler uses a soft tone and does not generate much heat. It will also turn off automatically as the door is closed, thus ensuring that it will not generate more heat in a spot than needed. The double-pane gray-smoked glass is included here to create a secure body that will be easy to tamper. Also, it keeps the chilled air inside the cooler without risking outside air coming in the way. There is also a front ventilation feature on the base of the cooler The front ventilation feature is designed to make it easier for air to come out of the cooler and to stay functional for as long as needed without becoming too frosted or even at risk of being overheated. You can rest assured that you can secure your wine bottles inside this cooler quite well. This is thanks to the security lock that is included here. This comes with a key that you can use to keep it locked if necessary. The Whyner Undercounter wine cooler is very effective with regards to not only storing wine but also for fitting in with the accents around your kitchen. 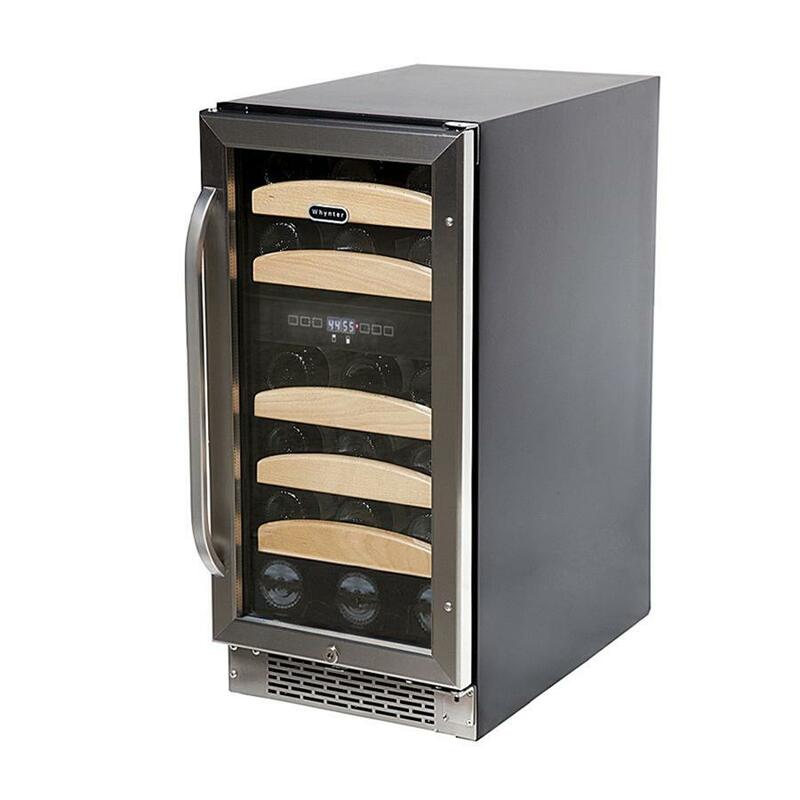 If you use this wine cooler then you’ll have space for plenty of bottles without having to sacrifice too much space in your area to make it fit. If you need a wine cooler that can be added right underneath any large installations in your home then the Whynter Undercounter model may work well. It can fit into many surfaces with ease and blends in with many surfaces.